Albert John Emptage, son of Edward Robert Emptage, a mariner, and Ann Elizabeth Hewett, was born in 1846, into a humble but proud family of mariners who lived their lives in and around Margate during the 18th and 19th century. Edward Robert was born in 1801 to parents, Henry Emptage and Susannah Le Brush. Henry was a Master Mariner and sadly Albert never knew his grandparents, as Henry died in 1836 and Susannah in 1826. If the family ever spoke of Henry and Susannah, the tales would have seemed wondrous to Albert, as it seems Susannah had French parents, and Henry had sailed the world in the Royal Navy and had fought in many battles. I wonder if Albert was ever told of his grandfather meeting Napoleon? No doubt many sea stories were handed down through the family, and to sit around a fireside on a cold winter’s night and listen to these stories must have filled Albert with awe. It seems that Albert, like his father, grandfather, and great grandfather Humphrey Emptage before him, was destined to a life at sea, though locally rather than sailing the distant seas. Albert was to become a self employed boatman and lifeboatman. If Albert ever had thoughts of wanting to be different from the folk in Margate, he certainly got his wish as he stood 6 feet 8 inches tall. Photographs and paintings show him to be an imposing figure standing in his oilskin jacket and hat and, no doubt, commanding attention from all around him. Albert lived with his family at two places, first at 31, Pleasant Row and then later at 4a, Spellers Court, both addresses denoting his humble background. Albert had 6 siblings and 3 half siblings born between 1821 and 1854. On the 11 November 1855, Albert age 9 lost his half brother, Robert John Emptage, a Mariner who drowned in Cossack Bay during the Crimean War. Robert was a Royal Navy Seaman who, whilst serving on HMS Leander, apparently fell overboard and drowned. The mystery of his drowning may never be solved but we do know that Robert’s body was found and he was later buried in a site overlooking Cossack Bay. As a youngster age 10, Albert and his friend John Martin were taken to court in Margate for stealing biscuits from a fishing boat called the Ondine which belonged to a George Henry Emptage and John Fox. It was fortunate that both boys were let off with a reprimand from the magistrate. It is highly likely that, less than three months later, on 5 January 1857, Albert was among the huge crowds who stood on the cliffs watching the crew of the lugger Ocean, which included four of his older cousins, rescue the twenty eight crew of the Northern Belle, an American ship which had been driven on to the rocks off Foreness Point in atrocious weather conditions. And watched as the lugger Victory was swamped by the heavy seas and disappeared beneath the waves, drowning the nine crew, including his uncle and another cousin. Young Albert can have had no doubt of the dangers of the sea, even close to home. Albert married Annie Elizabeth Warner on the 11 October 1865. Their life together was not without its ups and downs. On the 3 April 1866, and only 6 months into their marriage, Annie took Albert to court for an alleged assault against her. Annie said that Albert had thrashed her and turned her out of doors. After being sworn in, Annie then decided not to press charges. Albert complained that Annie had been spending his money to pay off debts, but it caused great laughter in the courtroom when Reverend G.W. Sicklemore pointed out to Albert that “Yes, but you ought to have found that out before, when a man takes a wife, he takes her debts too.” After consideration the case was dismissed. 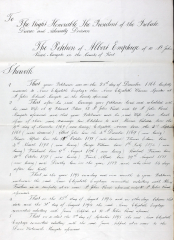 On the 19 May 1866, Albert was a witness in a child custody case in which he and his cousin Edward Emptage both admitted to having a sexual encounter with an Elizabeth Hurst in 1865, though they were both married men. The child was not theirs but the Elizabeth Hurst had alleged that she had not been intimate with any other man than the man she accused of being the child’s father, John Davison. Albert’s and Annie’s warring lives continued. On the 15 April 1869, they were back in court again and Albert was once more charged with assaulting his wife. Annie once again complained that Albert had thrashed her, and Albert mentioned to the court that he had been behaving himself since the last court appearance in 1866. He was fined 20 pounds, or go to gaol. Albert said he could not pay the sureties of 10 pounds each and would have to go to gaol. It is likely that he eventually came up with the money because Albert remained a free man. Minnie Rebecca (1866–1931), Elizabeth Annie (1868–1871), Albert John (1869–1954), Horace Alfred (1871–1877), Thomas Edwin Edward (1872–1960), George William (1875–1914), Frederick Emptage (1877–1943), Rachel Frances (1879–1935), Frank Alfred (1881–1975) and Ann Elizabeth (1883–1883). Like so many families in those days, it was a common occurrence for parents to lose a child prematurely, with Albert and Annie also enduring the heartbreak of seeing a son or daughter not surviving. Their second daughter, Elizabeth Annie died age 3 years and 3 months, on the 22 November 1871, followed by their son, Horace Alfred on the 7 October 1877 age 6. Five years later on the 26 March 1883, their daughter, Ann Elizabeth, having been born two months prematurely, died age 10 weeks. Albert and Annie worked hard to clothe and feed their children. Although Albert was a boatman, he had also spent some time as a Fly driver, thus supplementing his income. On the 16 July 1873, Albert was driving a Fly carriage, which was a two wheeled carriage pulled by a horse, along the Parade in Margate, when he was spotted by a plain clothes policeman who stopped him for breaking the law. Apparently Albert was picking up customers en route without going back to the Fly station and waiting for a customer. 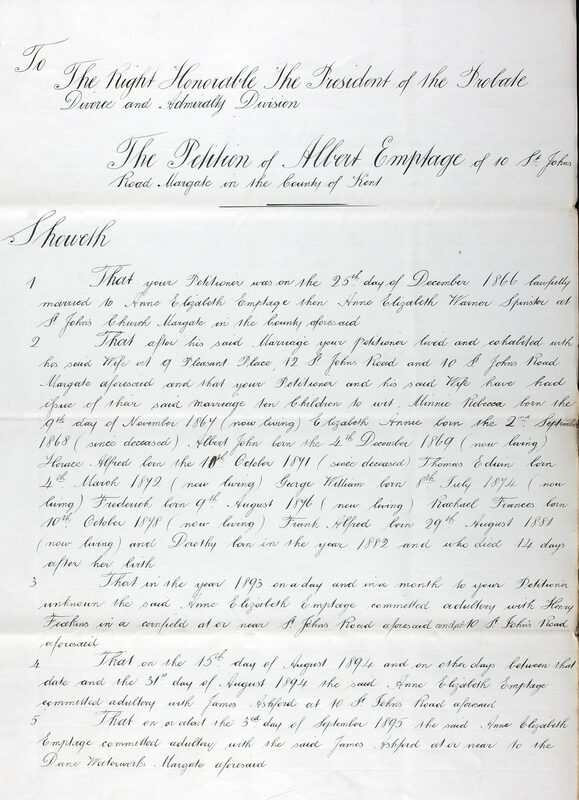 It appears that Albert was learning his entrepreneurial skills even then age 27, but unfortunately in this case he was caught and fined 10 shillings with 7 shillings costs at the Borough Magistrates Court. By 1883 Albert and Annie had been living at 10, St John’s Road for over 12 years. Albert was 36 years old and had established himself as a boatman and lifeboatman within the small community of Margate and was well respected. Perhaps Albert and Annie were mismatched from the start. Evidently their marriage was a little turbulent, but they did raise ten children and together they endured the heartache of losing three of them as infants. However, there came a time for it to end and, on the 19 September 1895, Albert applied for a divorce at the High Court of Justice Probate Divorce and Admiralty Division in London. Albert accused Annie of having a history of committing adultery. The divorce was approved and Albert and Annie parted ways. That Albert was able to afford to obtain a divorce is remarkable. The divorce law had been introduced in 1858 but, for most people, it was too expensive a process and so most working class couples simply separated and went their own way, as did my grandfather Henry Thomas Emptage. However, Albert had standing in the community and, unlike Henry Thomas, wouldn’t have wanted to move away. Annie remained at the family home at 10, St Johns Road, and Albert later moved into a house at 19, Dane Park Road. Just seventeen months later, Annie Elizabeth Emptage nee Warner died on the 22 February 1897, at her home aged 54 and was buried at St John the Baptist, Margate. Annie had eleven children, ten with Albert John and a daughter, Emily Caroline Warner who was born in 1860 and sadly died age 11 in 1871. Emily’s father was unknown. A year after Annie’s death, on the 30 April 1898, Albert married Nellie Louise Euden, a spinster age 21, daughter of William Hayman Euden and Mary Catherine (Parker). It is interesting to see that Albert and Nellie married in the Parish Church at Birchington instead of St John the Baptist Church in Margate. I suspect it might have been a quiet wedding and away from the people of Margate who all knew Albert, but as Nellie was born in Birchington, perhaps she requested that the All Saints Parish Church would be more appropriate. Certainly the age difference of 31 years would have raised a few eyebrows, but I suspect that Albert never cared a jot about that. Albert and Nellie had two children: Arthur William, who was born in January 1899 but suffered from a disease called marasmus and lived only a few days, and Herbert John, in July 1900, see notes below. Albert had ten children and twenty four grandchildren from his marriage to Annie and a further two children and five grandchildren from his marriage with Nellie. Like most large families the good times were interspersed with the bad times and not all of Albert’s children and grandchildren were adverse to hardship. Notes on some of them are given below. 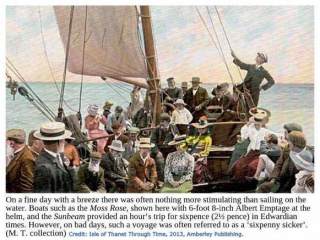 Over the years, Albert owned two pleasure yachts, first Favourite and then Moss Rose, giving trips around the bay to holiday makers on fine days. In Edwardian times, it would be sixpence for an hour. He would enter his boats in local regattas, with the aim of winning the first prize of £10. As reported in 1873, the course was from the Margate jetty, around the Tongue Light ship and back again. Competing against Ocean Bride, the starting gun was fired at 10.25 with a nasty sea running and a strong breeze from the north east. The yachts carried whole mainsails, mizens and foresails, but had topmasts struck and small jibs set. On that occasion Albert’s yacht won but it was only the other yacht’s second outing and it was foreseen that it would be up against a formidable adversary in years to come. Albert’s life as a lifeboatman is well documented with numerous newspaper articles about his time as a Coxswain with the Margate lifeboats. On the 9 September 1884, Albert rescued a lad named Haynes who accidentally fell into the sea whilst fishing from under the jetty. Albert was on his yacht Favourite at the time and raced to save the boy by jumping into the sea. He was aided by an E. Whitehead who was on his yacht Royal Alfred who succeeded in catching hold of the boy by leaping on the lower timbers under the jetty. Albert was the coxswain of a Margate lifeboat when he and a team went to the rescue of a steamship called the Dunkirk de Ville which was being towed by tug from Calais to Gravesend. In rough seas in February 1890, the towrope snapped and the steamship ran aground at North Sand Head off Deal in Kent. Sadly the owner of the vessel drowned but Albert and his crew rescued the survivors and brought them safely back to shore. Albert came to prominence on the 18 November 1893 after a dramatic sea rescue of the crew of the brigantine Druide of Cardiff which had struck Fulsome Rock off Margate in a fearful gale. The National Lifeboat Quiver had been launched but was was driven back three times (events which led to an enquiry). A lifeboat from Ramsgate was launched but also failed to reach the brigantine, which was too close to the land. Albert was watching and made the decision to attempt the rescue in the 22 foot skiff of his yacht Moss Rose, bringing on board another five lifeboatmen as crew. In the terrible conditions, it took over an hour’s hard rowing to reach the ship, with three oars being broken in the process. Finally they reached the lee side of the Druide and rescued the five crew who were suffering from exhaustion and exposure and landed them safely. The marine parade in Margate was lined with hundreds of cheering spectators, and for their heroic rescue, Albert and his crew were awarded sea gallantry medals. Albert’s medals are now housed in the Margate Museum for everyone to see. On the 13 December in 1896, Albert as coxswain of the lifeboat Quiver rowed out with his crew to rescue the crew of the schooner Eva of Carrickfergus, Ireland. The schooner had run aground in a storm on Tongue Sands and was unable to get off. The schooner was carrying a cargo of stone bound for Queenborough and had submerged in Prince’s Channel. The deck crew had lashed themselves to the rigging awaiting rescue. Sadly the captain and the cook had been washed away and drowned when attempting to use their own lifeboat. Albert and his men rescued the survivors and the boat returned to Margate taking four hours to reach safety. In December 1897 came an event which, whilst highlighting the courage of the mariner community, traumatised the people of Margate. In the early hours of 2 December, the Persian Empire collided with the West Hartlepool Steamship Carlisle City and was in distress. The surfboat Friends to all Nations was launched with a crew of thirteen, to attempt a rescue in hazardous conditions. The conditions were such that the surfboat capsized and nine lifeboatmen perished. The lifeboat Quiver was launched with Coxswain Albert John Emptage at the helm, and through almost impossible odds the men succeeded in rescuing the stricken seamen on the Persian Empire and safely brought them back to shore. On the 20 October 1898, a Mrs Amy C. Berrick in an excitable state of mind and partly unclothed, was shouting loudly and threatening to commit suicide by throwing herself into the sea by the lower pier in Margate. Albert, who was with his pleasure yacht Moss Rose, saw the woman and along with ex police constable H. Hopper, they guided the distressed woman to the police station where she was looked after. Unfortunately her husband claimed he could not receive her back home but would try to make arrangements to have her taken care of. On 11 February 1900, Coxswain Albert John Emptage, in response from signals from the Tongue Lighthouse, launched the lifeboat Civil Service and rowed out to the Picton which was in distress, having run aground on the treacherous Shingles off Margate. It was fortuitous that the keeper of the Tongue Lighthouse saw them. The lifeboat returned, having on board the captain and all the crew of the Picton, which had been carrying a cargo of acids from Shoreham to London. It seems that, although Albert had experienced a difficult family and domestic life, as regards the sea he had lived a charmed life considering all the rescues he attended, unlike his relatives, friends and colleagues who had paid the ultimate price for their bravery. Albert John Emptage died in 1929, aged 83 and was buried at Margate Cemetery on 25 June 1929. His widow, Nellie, married William J Dicken in 1933. She was 56 years old. The funeral took place, at Margate, yesterday, of Mr. Albert John Emptage, who passed way at his residence, Dane Park Road, Margate, a week previously, in his 84th year. Mr. Emptage, who was the son of a Margate fisherman, was formerly coxswain of the Margate lifeboat, and had been connected with the sea all his life. At the age of eight he began to work with the boats, and subsequently became master of the pleasure craft Moss Rose. He was also part owner of the Sunbeam. In his forty years’ connection with the Margate lifeboats he was coxswain of the Quiver, the Eliza Harriet, and the Civil Service. He took part in many gallant rescues at sea, and among his decorations were three medals presented to him when, with several comrades, he rescued the crew of the Druide on the 19th November 1893. He was coxswain of the lifeboat when the vessel Persian Empire was wrecked off Margate in 1897, and assisted to save twenty-seven lives on that occasion. 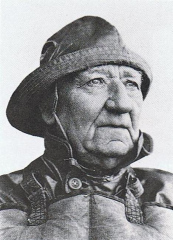 I like to picture Albert in his later years, long after he retired as a lifeboatman, sitting on the seafront at Margate and looking out to sea and thinking of the amazing life he had led. Thank you Albert. Minnie Rebecca, was 21 years old when she gave birth to an illegitimate daughter, Ethel Emptage, born on the 9 July 1888 in the Islington Workhouse, London. Unfortunately no further records can be located for Ethel and it is probable that she was adopted soon after her birth and her surname changed. George William, born in 1875, enlisted in the Royal Navy. As a Petty Officer, he went down with his ship, the Hogue, when it was torpedoed by a German U-boat in 1914. He left a widow, Frances Anne. See In Memoriam. Rachel Frances gave birth to an illegitimate daughter, Minnie Clara in the Isle of Thanet Workhouse on the 28 July 1898, when she was 18 years old. On the 24 January 1900, Rachel gave birth to an illegitimate son, Frederick who was born in the Hackney Union Workhouse in London. He died a year later on the 28 March 1901. At the time of the census, 31 March 1901, Rachel was working at the Nayland Rock Hotel in Margate as a domestic servant, whilst her daughter, Minnie Clara, aged 33 months was being looked after by her great aunt, Mary West at 53, Milton Road, Margate. Albert’s granddaughter, Minnie Clara, aged 20, married George James Smith, aged 42, on the 20 April 1919, at the registry office in Margate. We don’t know what happened to their marriage but in 1925, Minnie Clara age 26, gave birth to Arthur Reginald Smith in the Manston Union Workhouse. Three years later, Minnie was in the Isle of Thanet Union Workhouse and gave birth to a son, Frank Sidney Smith. Minnie’s life has been documented by Frank, a painter who has illustrated his biography, “A Brush with Life”. Read about his life here. Albert and Nellie’s son, Herbert John, enlisted into the Army Service Corps age 16, and later became a driver, and saw action in France. Herbert remained in the army after WW1. He was attached to the French Red Cross and served in Africa. Herbert married Irene Ellen Chapman in 1923, but sadly died on the 30 December 1935 at 29, Prestedge Avenue in Ramsgate aged only 35. Herbert and Irene gave five grandchildren to Albert and Nellie before his untimely death. Three of those children were present at the dedication of the memorial to the crew of the lugger Victory.